The 1954 Hudson Jet was Hudson's entry into the compact field. The honour of introducing the modern compact car to the North American market fell to the independent automakers. 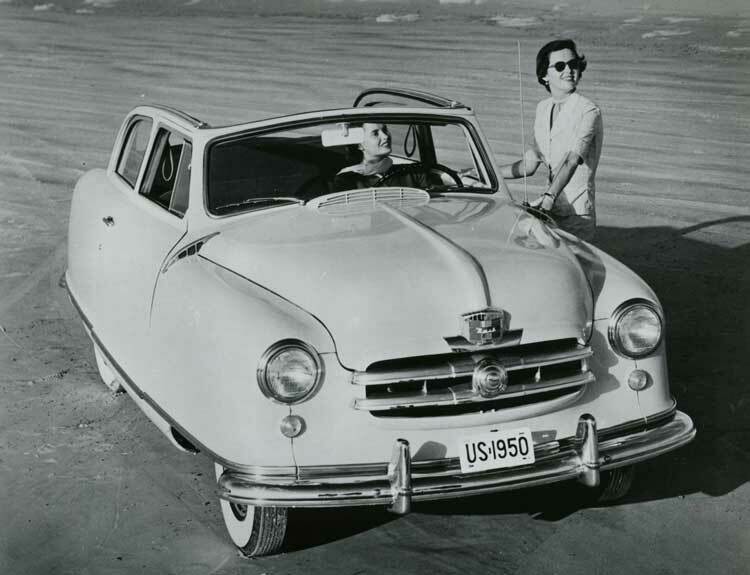 Nash was ready in 1948, but wisely delayed introduction of its 2 540-millimetre (100-inch) wheelbase entry until March 15th, 1950 in order to take advantage of pent-up post-war consumer demands for any new car. management to create a compact of its own. Rambler debuted as a snazzy station wagon and an adorable convertible. Complete with white-walled tires, radio, heater and leather-trimmed seats, the snazzy little Nash listed for only $7 more than a stripped, base-priced Chevrolet. 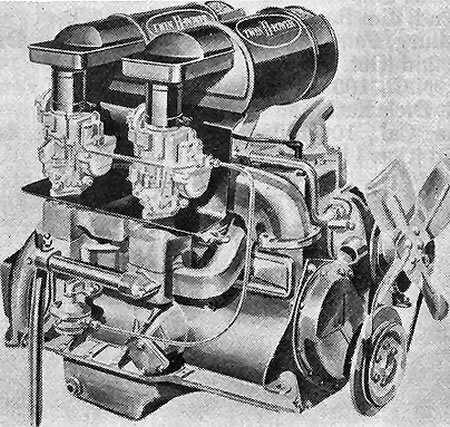 Kaiser-Frazer's Henry J was shunned by Canadian consumers. Hard on the heels of the Nash Rambler's entry into the compact market was the Henry J from upstart Kaiser-Frazer. While the Henry J had been unveiled before the Nash Rambler, production problems prevented it from reaching dealers. At Kaiser-Fraser, the corporate philosophy regarding compact cars was the exact opposite of the thinking at Nash. 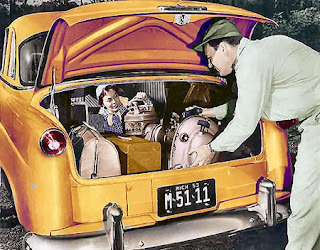 In the time-honoured tradition of Henry Ford and his very basic Model T, K-F's little Henry J was offered as a bare-bones vehicle with very limited optional equipment. Canadians didn't care much for the car or the philosophy behind its production. 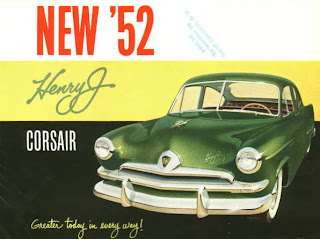 Sales figures for Henry J were lumped in with Kaiser for 1952. Records show that 1,876 units were sold domestically throughout the Dominion of Canada in the 1952 calendar year. buyers in Canada because of its hefty price tag. Pioneer automaker Willys-Overland re-entered the passenger car business in 1952. The company had been busy building the versitile Jeep for the military. After World War Two, designer Brooks Stevens was called upon to create Jeep variants for civilian use. Willys then launched a quartet of sleek Aero sedans. The compact beauty was imported from Toledo, Ohio. With a hefty price tag of $2,542 for the base Willys Aero Wing, first year sales in Canada came to only 255 units for the Willys. 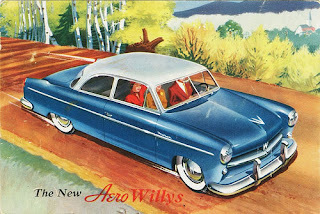 Last but not least, Hudson intended to recapture market share for itself with the 1953 introduction of its compact Jet. Dealers had long clamoured for a small car, complaining that the company was missing the boat as the only independent without a presence in the compact field. Company president A. E. Barit decided to tool up a pint-sized companion for the big Hudson. 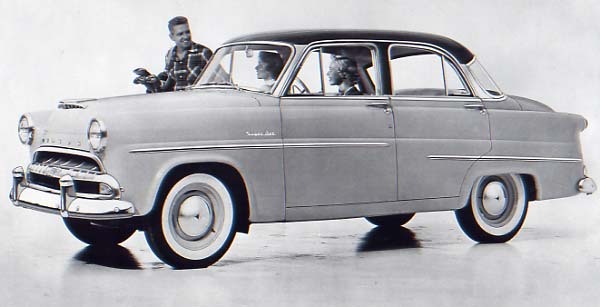 New for the 1954 selling season was the Hudson Jet Family Club Sedan. Like other Jets, the two-door model rode on a 105-inch wheelbase. It listed for $2,365. Frank Spring was the highly talented in-house stylist for Hudson. He had his hands full trying to create an attractive car and satisfy the peculiar idiosyncrasies of Hudson's president. Barit originally ordered a vehicle similar to the Fiat 1400. When he saw it, Barit didn’t like the result. The Fiat 1400 was Hudson's benchmark. A 1952 model is seen here. The president personally ordered higher fender lines, beltlines and rooflines to accommodate chair-like seats in which passengers would sit up straight and tall. The small rear window was redesigned and given wrap-around glass, similar to that seen on the 1952 Ford. Barit then fell in love with Oldsmobile’s fuselage-like taillights and ordered similar affairs be welded onto the Jet's body. The 1954 Hudson Jet Liner two-door sedan listed for $2,635. It included many refinements including oodles of extra chrome trim andfull wheel covers. The production version of the Hudson Jet only faintly resembled its larger kin. It was taller and much narrower than the big Hudsons and somehow managed to miss completely the low-slung Step-down look for which Hudson had become so famous. Over-engineered, somewhat vague in styling and dreadfully over-priced, at $2,392 plus taxes, the Jet simply didn’t fly. Although it cost $552 less than a full-sized Hudson Wasp, the Jet’s price tag rang in at more than $300 more than a full-sized Chevrolet and more than $200 more than a Ford. Pricing was a headache and so were the seemingly endless production delays. 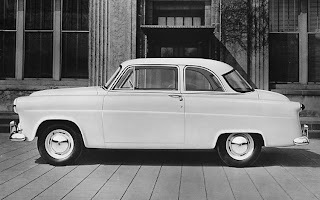 Shown to the public in the fall of ’52 with the rest of the Hudson lineup, production problems, parts shortages and labour troubles kept the half-pint Hudsons out of dealer’s showrooms until March 13th. On top of all those troubles were strict manufacturing and materiel restrictions placed on all the automakers by Ottawa and Washington as a result of the police action on the Korean Peninsula. When Hudson's junior Jets finally began to roll out the factory doors, many potential customers passed, preferring to buy a small, more stylish looking car from Nash or Willys-Overland. Aside from domestic competition, the Jet also had to do battle with British Ford offerings as well as GM’s captive Vauxhall import. Then there was Austin, Volkswagen, Hillman and Morris to contend with. Worst of all for the Jet, many Hudson dealers throughout the Dominion were already twinned with British automakers Hillman or Austin. If style was the Jet’s weak point, power certainly was not. The Jet’s engine was as powerful as Labrador Falls. It boasted an all-new, six-cylinder L-head, sharing its bore and stroke with the now discontinued Hudson Eight. Ranging from 104 to 114 horsepower, test Jets were impressive, clocked in excess of 160 kilometres (100 miles per hour [ancient Canadian units of velocity]). Billed as the ‘wonder car in the low-price field’ the small Hudson was offered in two series, the standard Jet and the Super Jet. An upscale two-door Club Sedan was available in the more costly line. of white pleated vinyl seats trimmed in red, green or blue. With its unique dimensions, the Salon Lounge interior should have been absolutely cavernous but the floor didn’t appear to be step-down in design and passengers complained of being cramped in the back seat. The instrument panel was superbly crafted: a long wide brightwork band ran the width and housed controls, crowned by a domed, white numerals-on-black-faced speedometer. 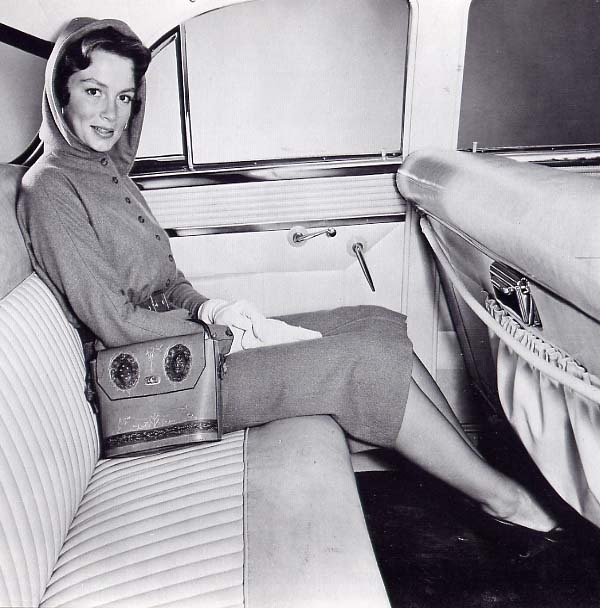 Hudson had invented idiot lights in ‘30s and in 1953, they were touted as Teleflash signals. Automatic transmission was an option; something one couldn’t get on a Willys or a Henry J. The gas pedal was moulded in the traditional Hudson triangle, lest one should ever forget the brand. The 1954 Hudson Super Jet four-door sedan sold for $2,516. Complete with snazzy continental spare, the 1954 Hudson Jet Liner four-door sedan was the most expensive model in Hudson’s compact family with its $2,649 price tag. Complete with continental spare, the 1954 Hudson Jet Liner four-door sedan was the most expensive model in Hudson’s compact family. It carried a $2,649 price tag.Workers built only base model, four-door Jets in the Tilbury, Ontario plant; all other Hudsons--large and small--were imported. Records show that Jet assembly began on March 2, 1953 and a total of 918 domestically assembled units rolled off the lines during the abbreviated 1953 model year. While Hudson pitched the Jet as a police car, there were few buyers. The Canadawide unveiling of the 1954 Hudsons, including the Jet, took place on October 2, 1953. The 251 dealers welcomed the Jet back with open arms, in hopes that it would bolster sagging sales. Those hopes were quickly dashed. 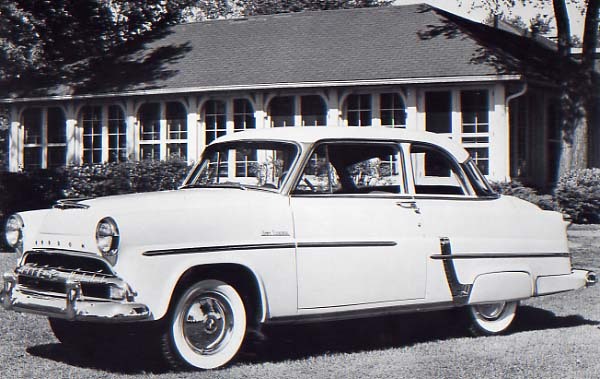 Hudson sales plummeted to 1,061 deliveries for 1953 from 1,901units the previous calendar year. There does appear to be a discrepancy between reported sales and new car registrations, however. Records indicate that 1,947 new Hudsons were registered in calendar year 1953, up from 1,430 new Hudson registrations in 1952. Figures may be in dispute but there is no dispute whatsoever that Hudson’s highest market penetration was in Prince Edward Island. Domestic Jet production for the 1954 model year in the Tilbury, Ontario assembly plant began in November of 1953. In May of 1954, it was announced that Hudson had merged with Nash-Kelvinator. 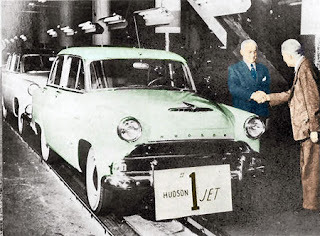 Since Hudson's compact car competed directly against the highly popular Nash Rambler, the Jet was permanently grounded on July 19, when the last Hudson Jet rolled out the doors of the Tilbury plant. Only 650 compact Hudsons had been built during the 1954 model year. Hudson itself was on life support; the grand marque would be laid to rest at the end of the 1957 model year.